The 2018 issue of Impact magazine is here! This year's publication celebrates the grand opening of the Ed Kaplan Family Institute for Innovation and Tech Entrepreneurship and the donors who made this dream a reality. 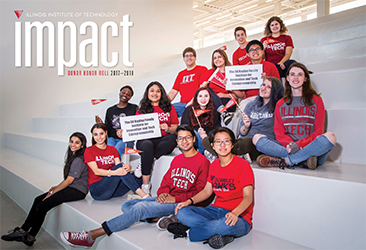 The online issue of Impact magazine contains feature stories of select donors who have impacted the university and the members of Illinois Institute of Technology's prestigious giving societies. For a printed publication, please contact Kellie Fields, director of donor relations & stewardship, at kfields5@iit.edu or 312.567.3049.